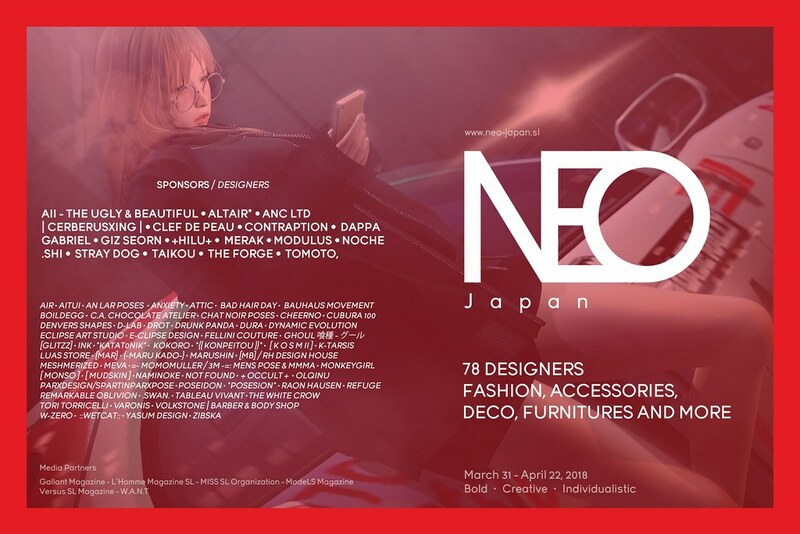 the NEO-Japan SL event recently opened and you have shared with us the excitement about the opening of the event, as well as many of you attended the fashion show, by MISS SL Agency. NEO-JAPAN. A bold, creative and individualistic style that is more of a lifestyle. In essence, boundaries are tested with a clever combination of diverse elements. It is an evolved revolutionary statement, trendsetting with a strong international cultural influence. Create a styling, that is bold, creative and individualistic, using items from the NEO-Japan SL event. Please create a styling, expressing the NEO-Japan SL founders approach on the word NEO. Make it modern, bold, unique, fresh… perhaps quirky. For your styling you must mix and match items from, at least, three (3) different designers, the items must be from the NEO-Japan SL event. You may use items from other designers too, of course. For your styling you must use, at least, one (1) primary (yellow, blue or red) or secondary color. If you are unsure, what a secondary color is, please have a look at this link. You may use white, black and gray in your styling, but they do not count as primary or secondary color anyhow. If you are unsure about the color of your choice, please ask a team member to verify if your color is eligible for this challenge. Poses do not count as an item within your styling. You must not request any review copy for items from the NEO-Japan SL participating designers. The models, who had the privilege to be models in the NEO-Japan SL Fashion show last Saturday, may not reuse the items, that have been provided to them for their show styling. Please choose a default pose, an appropriate walk and a pose set for about 60 seconds to present your styling. Please prepare a curtain-, back-, reverse-, 180° pose also, just in case. I have asked a few candidates within their individual feedbacks, to show a 360° turn with their poses in the next challenge. I suppose it’s fair enough to ask all of you to do the same. Please write in your styling description, your inspiration for the word NEO, or NEO-Japan, the inspiration for your styling. Please list in your description all items used from the NEO-Japan SL event and why you chose them. Your styling description must be submit until Thursday, April 5, at 06:00 p.m. SLT. Rehearsals are scheduled for Friday, April 6, at 10:00 a.m. SLT and 05:00 p.m. SLT. It is mandatory to attend one of the both rehearsals, to be eligible to walk in the challenge. The third runway challenge is scheduled for Saturday, April 7, at 10:00 a.m. SLT and will be hosted at the NEO-Japan SL event. We hope everyone will enjoy the challenge and look forward to see your styling ideas.